Staying safe as the hotter weather approaches! 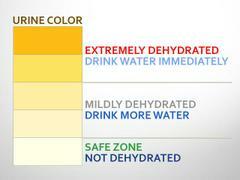 (In all seriousness) The color of your urine can tell you whether or not you are hydrated or dehydrated. Check out the attached image to see where you stand. NOTE: Other health factors contribute to the color as well. Remember to drink plenty of water when outside in the heat.! Even if you're not thirsty. Choose low sugar and low sodium sports drinks if possible or dilute with water for electrolyte replacement. Avoid alcohol and soft drinks; these can make you even more dehydrated. Take frequent breaks in the air conditioning as often as possible, place a cool wet towel on your neck and be sure to eat something if playing or working outside. Also, please check on your neighbors especially the elderly in times of hot weather to ensure that they have the means of staying cool and hydrated. Stay safe, keep cool and hydrated, it will only get hotter. Please check out our facebook page and like it! The direct link is www.facebook.com/stfpd11 we keep it up to date with great information on a daily basis.